It wasn’t long till I was back at the Orchard Theatre for another Press Night. 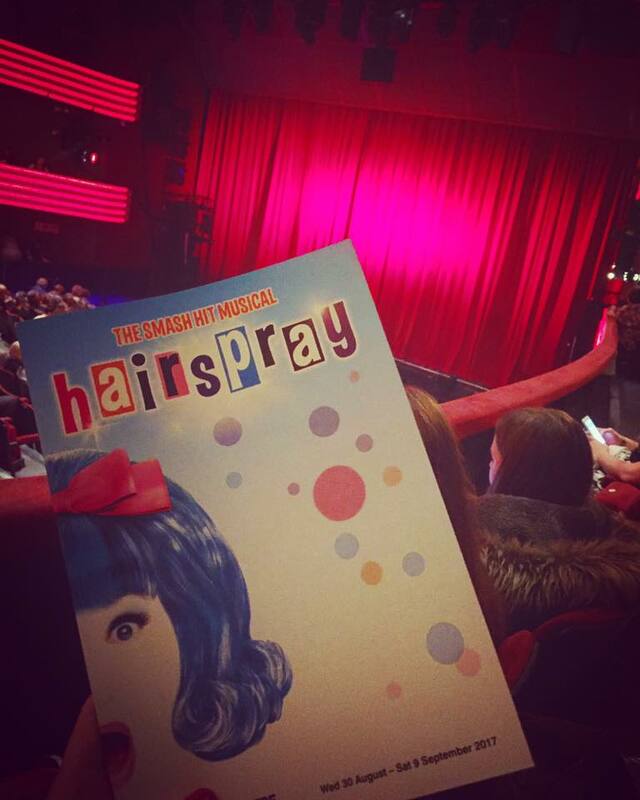 Tonight it was back to musical land, with the opening night of Hairspray! I was intrigued as to what this tour had in store, having seen the show before at the Mayflower, Southampton in 2013 and I will honest in saying I wasn’t too impressed. However, tonight is a different cast and a different director. For the first time I was seated in the circle of the Orchard, having mainly been situated in the stalls, and upper circle it was nice to view from another perspective. I was in Row B seat 5, second row but curved to the right hand side of the stage (or stage left to the performers). We were close to the action; with faces visible throughout the only restriction you had was the bottom right corner was hidden at times. At first it wasn’t too much of a problem but during ‘Without Love’ with part of the song performed in that corner it lead to many of the audience leaning forward and with doing so made it hard to see what was going on. But I couldn’t complain and for the most of the performance it was a minor hiccup. 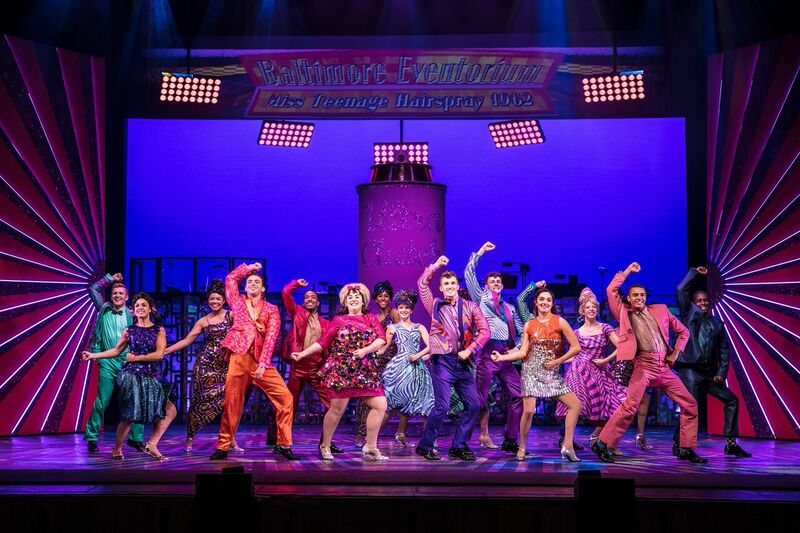 Hairspray tells the story of Tracy Turnblad, a big girl with bigger hair, and an even bigger dream! Living in Baltimore 1962 we watch her dance her way onto the ‘Corny Collins Show’ which is on national TV. Winning the hearts of the public (and teen idol Link Larkin) she becomes the local star, which soon she uses such fame to help fight for integration. However, her fight doesn’t come without obstacles – will Tracy succeed in Equality for all? 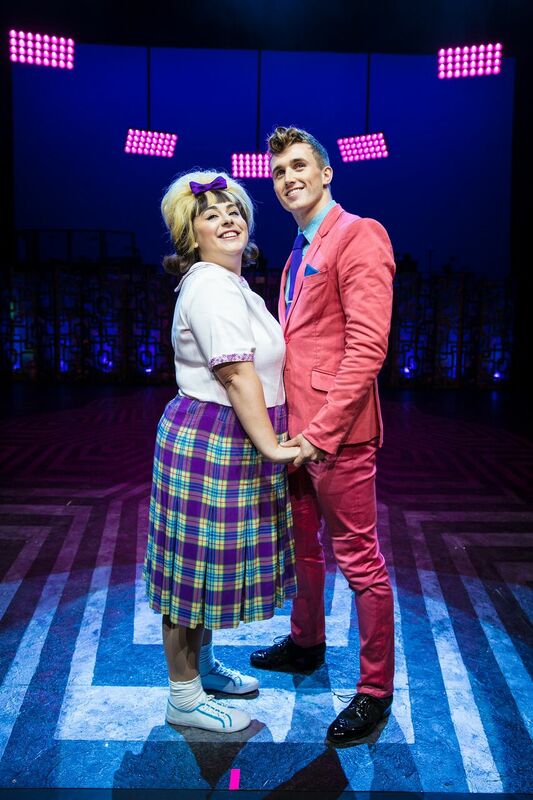 As stated before I had had the chance to catch the 2013 tour of Hairspray, which I had said following the viewing I was unsure as to whether I would return again if it did come around. Well, I was so happy I did! Director Paul Kerrytson really brought the fun and enjoyment throughout the show, with limited set and support of screen it enabled us to watch the actors and limit the amount of set changes. You also could admire the many dancing numbers choreographed by Drew Mconie, who greatly portrayed the 60s in each step. ‘You Can’t Stop the Beat’ was a showstopper finale that had the audience clapping, and dancing in their seats. It was great to watch and be part of such a buzzing atmosphere – something I didn’t quite accomplish in my 2013 viewing. One things for sure, is every one of the cast were great to watch. Each looking as though they are really enjoying themselves throughout. All the ensemble kept their roles strong with good interactions and background acting to suit. 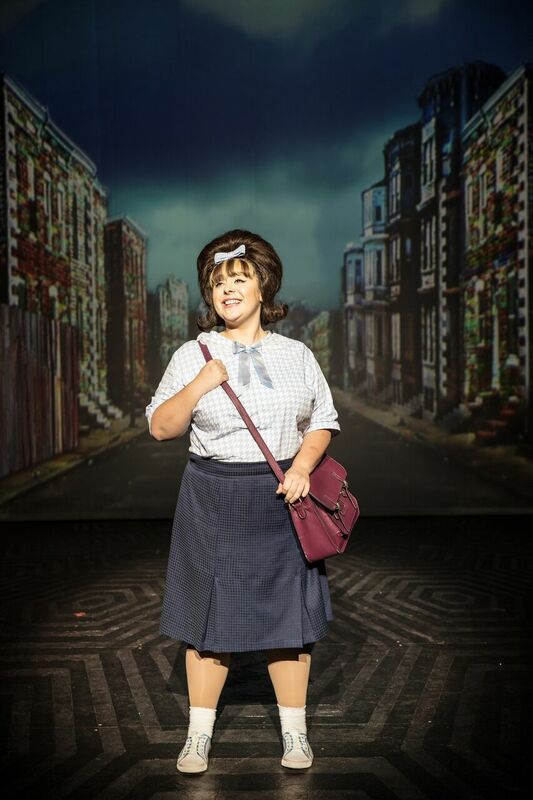 Newcomer to the stage was Rebecca Mendoza, playing the lead role of Tracy Turnblad. Her performance shone throughout, she had the moves, the voice, and the character for Tracy. Her take was also very entertaining, having the audience laugh at her reactions to link was defiantly a highlight. That being said her relationship with Link played by Edward Chitticks was greatly displayed, however Edward took a while to warm to for me as at times his character was a little wooden and singing not as strong as one would have liked for the role of Link. 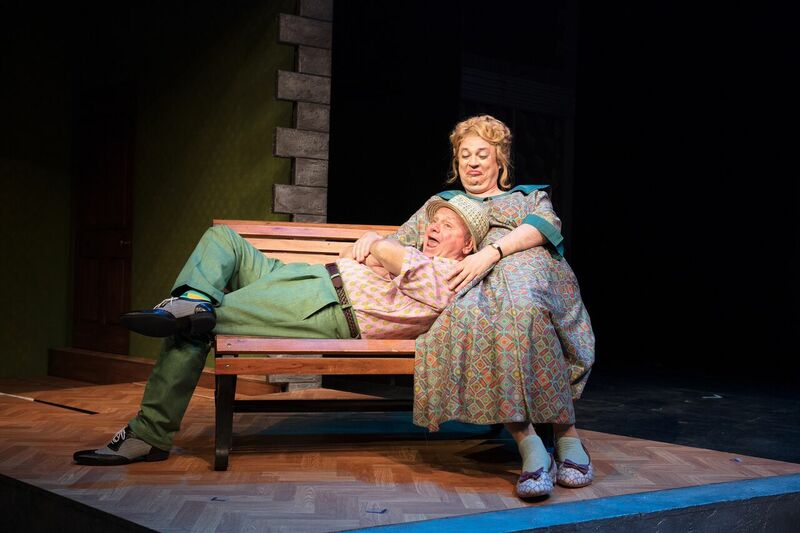 Tracy Parents, Edna and Wilbur were played by Matt Rixon, and Norman Pace were a perfect duo. Matt’s Edna was great to watch, a role that has been honoured to a male performer in respect to the passing of the original Edna, Divine in the 1988 film version. Matt does this justice with no doubt, his interaction with Norman, especially during ‘You’re Timeless to Me’ had the audience chuckling with sometimes being off script … or as they said. Norman also had a lovely warm tone to his voice which complimented Matt’s very well. I was very much looking forward to finally seeing Layton Williams on stage, having missed the chance to see him in Rent earlier in the year due to an injury where he played Angel. I was very interested to see how he portrayed Seaweed – who is the far opposite of Angel but, not only has he got the pipes, but he can dance like no other! Every step was so smooth and mesmerizing to watch, with flips especially he really is a triple treat! Seaweed’s mother Motormouth Maybelle was played by Brenda Edwards, famous for being on the X Factor she has taken the theatre world by storm having seen her as Killer Queen in We Will Rock You I knew I was in for something good. I had also catches a glimpse of her singing ‘I Know Where I’ve Been‘ before at the press launch for the Orchard, so to hear it once again was pure delight. I look forward to seeing what future roles are coming her way. Penny Pingleton, the ‘innocent’ friend of Tracy Turnblad was played by Annalise. Her voice is lovely to listen to, however at times her acting and voice would grind on the ears at times. But her character was brilliant, especially with her transformation when meeting Seaweed and falling in love. Other mentions go to Tracey Penn, and Graham Macduff who took on multiple roles throughout the show, both of whom did brilliantly changing persona on each – however at times Tracey’s did seem quite similar. It is always a delight to see Graham on stage, once again bringing a little mischief to the stage to get his moment! Tonight’s performance received a greatly deserved standing ovation, having the audience in their seat dancing and clapping along even before the bows started. It is such an uplifting show, that doesn’t fail to put a smile on your face! 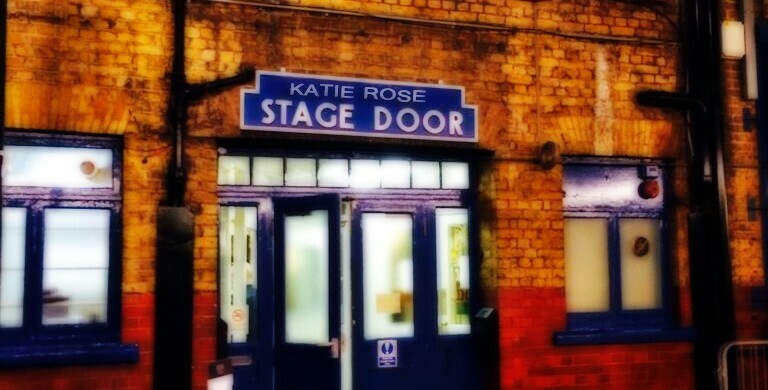 One for all ages – and a great 1st musical to some it is a brilliant, entertaining night out! 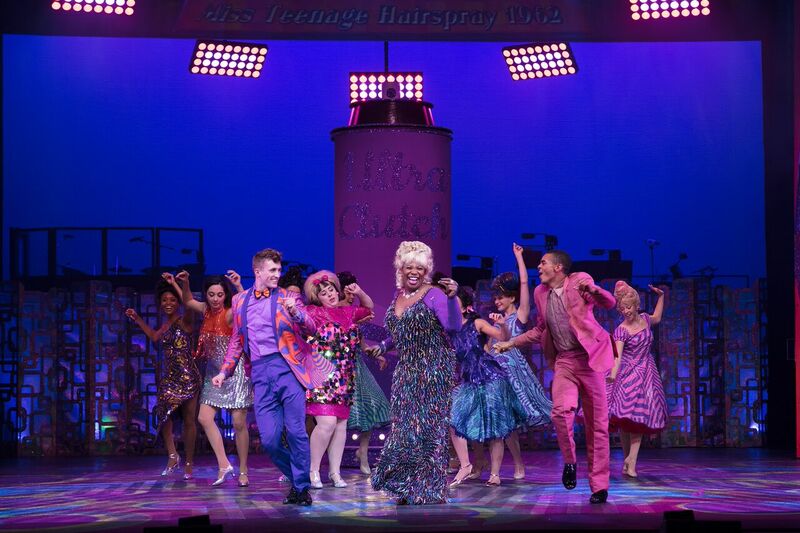 Hairspray performing for a 2 week run at the Orchard until the 9th September, for ticket information here. It will then Embark on its UK Tour, for further information go here. Hi Rose, would you please please please come and review our show in Nov? We are Tunbridge Wells Operatic and Dramatic Society and are performing ‘My Fair Lady’ from 21st – 25th November at The Assembly halls theatre, Tunbridge wells.